Snapchat is a mobile application for sharing photos and videos. The originality of this application is to limit the viewing time of the media sent to its recipients. In this way, a message can only be visible to its recipient during a time range from one to ten seconds (although it is now possible to share content without time limit). Snap inc. which publishes this application, completed its initial public offering on March 2, 2017. At $17 per share at the time of its entry, the price very quickly soared to close to $28, only to stabilize below the $15 threshold from mid-July. After such variations, a shareholder can become a UX designer! We will see how. Snapchat is both a good and a bad example of how we have defined the user experience. In a previous article, In a previous article, we argued that the best indicator of the user experience was its actual use. With 191 million active users every day (in the first quarter of 2018), even without knowing the total size of the target, Snapchat probably offers a good experience to its users. However, the ergonomics of its interface does not comply with the standards of the discipline. However, in the same article, we mentioned the importance of the contribution of usability to the user experience. 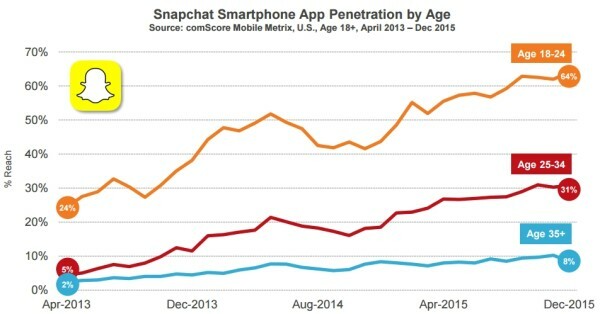 To understand this apparent paradox, we need to look at Snapchat’s penetration rate by age group. This is a particularly high rate. The other important information is the generational gap between young Americans and those over 35 years old, where Snapchat only has 8% of the market. However, it is precisely the ergonomics (or the lack of ergonomics) of the Snapchat interface that explains this, according to Newflux. According to them, the lack of ergonomics of the interface penalizes those over 40 years old. They are less inclined to discover how this application works, allowing young adults to stay among themselves. To summarize, young people use Snapchat because their parents cannot (or will not) do so. This explains how taking into account the characteristics of target users is central to the design of the user experience. Even at the expense of ergonomics and a part of the population, considered not to be part of the “target”. It is from this date that the company updated its application, without having asked its users for authorization (what they didn’t really like, that’s an understatement). Nevertheless, it seems that the markets were not insensitive to this effort, since the share price rose to $18.64 on April 21. The lady is not just anyone: she has 25.5 million followers on Twitter. Since then, the press, even the most serious, has titled that with a tweet, Kylie Jenner had caused the Snapchat share to fall. In fact, on the same day, the share price fell by 6% in one trading session, for a loss of $1.3 billion. Nevertheless, if this tweet was the origin, it came after a petition of more than a million users for the return to the old version. Indeed, in addition to being sometimes forced, the update of Snapchat to the new interface had not been appreciated by “historical” users. In any case, our purpose is not to determine whether this tweet from Kylie Jenner was enough to cause the Snap Inc. share to fall, or whether there are more complex reasons for this decline in price (history shows that some tweets may have had an effect on the price of some shares). We will limit ourselves to noting that this new version of the application did not ultimately have the expected effects. Neither investors nor users, because, according to some analysts, Snap Inc.’s disappointing results in the first quarter of 2018 are partly due to this change of interface. In the end, it will have been enough for Snap Inc. to publish its quarterly activity report on May 1, 2018 for the share price to fall by 15%. And Kylie Jenner had nothing to do with it this time. To answer the mischievous question in the title of this article, no, the price of a company’s stock does not allow us to measure the user experience of the service it offers. The price of a share measures only the value of the security, indexed in particular to the confidence that investors have in it at a given time. In this respect, an evolution of the product interface towards a better ergonomics may be likely to reassure investors if they think that this new interface will make it possible to attract new users. But this must not be done at the expense of current and proven users, otherwise this trust will be undermined. That’s what happened here, and Snapchat’s move back to partially revisit the changes will not have changed that. It will take a few more months to see if the choices made by Snap’s management are sufficient to calm the grumbling of “millennial” users and if this allows this application to reach a wider audience. On the other hand, it shows that user experience and ergonomics can influence the price of a share. This is not insignificant.